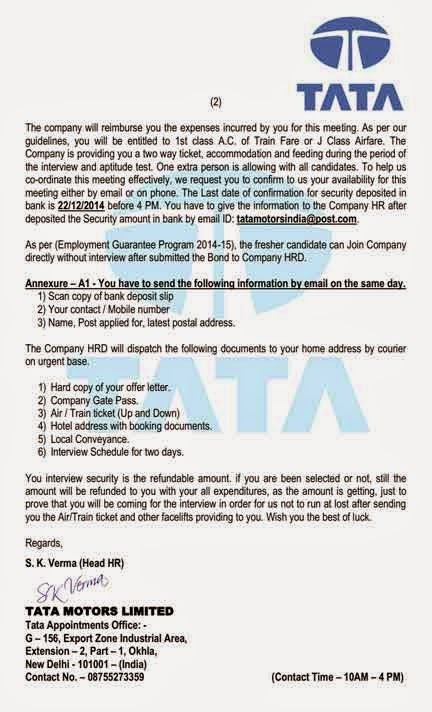 Scam Report: [Recruitment Scam] TATA MOTORS INDIA shared "TATA OFFER LETTER.pdf"
"Dear Candidate you are selected for an interview in TATA MOTORS. 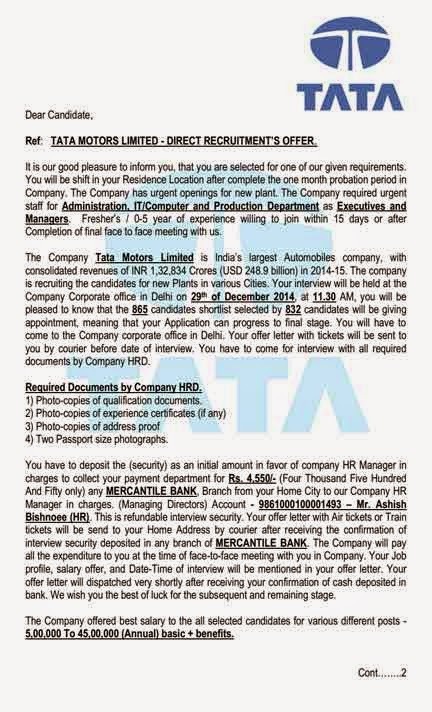 Kindly download your Offer Letter by link - http://goo.gl/97b6JO"
Ref: TATA MOTORS LIMITED – DIRECT RECRUITMENT’S OFFER. It is our good pleasure to inform you, that you are selected for one of our given requirements. You will be shift in your Residence Location after complete the one month probation period in Company. The Company has urgent openings for new plant. The Company required urgent staff for Administration IT/Computer and Production Department as Executives and Managers. Fresher’s / 0-5 year of experience willing to join with 15 days or after Completion of final face to face meeting with us. The Company Tata Motors Limited is India’s largest Automobiles company, with Consolidated revenues of INR 1, 32,834 Crores (USD 248.9 billion) in 2014-15. The company is recruiting the candidates for new Plants in various Cities. Your interview will be held at the Company Corporate office in Delhi on 29th of December 2014, at 11.30 AM, you will be pleased to know that the 865 candidates shortlist selected by 832 candidates will be giving appointment, meaning that your Application can progress to final stage. You will have to come to the Company corporate office in Delhi. Your offer letter with tickets will be sent to you by courier before date of interview. You have to come for interview with all required documents by Company HRD. Required Documents by Company HRD. 4) Two Passport size photographs.You have to deposit the (security) as an initial amount in favor of company HR Manager in charges to collect you payment department for Rs. 4,550/- (Four Thousand Five Hundred And Fifty only) any MERCANTILE BANK, Branch from your Home City to our Company HR Manager in charges. (Managing Directors) Account – 9861000100001493 – Mr. Ashish Bishnoee (HR). This is refundable interview security. Your offer letter with Air Tickets or Train tickets will be send to you Home Address by courier after receiving the confirmation of interview security deposited in any branch of MERCANTILE BANK. The Company will pay all the expenditure to you at the time of face-to-face meeting with you in Company. Your Job profile, salary offer, and Date-Time of interview will be mentioned in your offer letter. Your offer letter will dispatched very shortly after receiving your confirmation of cash deposited in bank. We wish you the best of luck for the subsequent and remaining stage. The Company offered best salary to the all selected candidates for various different posts – 5,00,000 To 45,00,000 (Annual) basic + benefits. The company will reimburse you the expenses incurred by you for this meeting. As per our guidelines, you will be entitled to 1st class A.C of Train Fare or J Class Airfare. The Company is providing you a two way ticket, accommodation and feeding during the period of the interview and aptitude test. One extra person is allowing with all candidates. To help us co-ordinate this meeting effectively, we request you to confirm to us you availability for this meeting either by email or on phone. The Last dated of confirmation for security deposited in bank is 22/12/2014 before 4 PM. You have to give the information to the Company HR after deposited the Security amount in bank by email ID: tatamotorsindia@post.com. As per (Employment Guarantee Program 2014-15), the fresher candidate can Join Company directly without interview after submitted the Bond to Company HRD. Annexure – A1 – You have to send the following information by email on the same day. 3) Name, Post applied for, latest postal address. The Company HRD will dispatch the following documents to you home address by courier on urgent base. 1) Hard Copy of you offer letter. 4) Hotel address with booking documents. 6) Interview Schedule for two days.You interview security is the refundable amount. If you are been selected or not, still the amount will be refunded to you with your all expenditures, as the amount is getting, just to prove that you will be coming for the interview in order for us not to run a lost after sending you the Air/Train ticket and other facelifts providing to you. Wish you the best of luck. I received same mail today so is it Totally scam or any reality in this offer?? I received two mail of this kind (both from Tata). One mail says Rs. 2000/- to be paid and another says 4500/- to different personal account. Why to personal account? If so, It should be to company account. Signature on both letters of SK Gupta. Totally fraud. First come, first served, this is what they say. yeh kya halva he? And more over, does it look like a standard call letter from a reputed company like Tata,..? i recived mail from sk gupta regards tata group iknow it is fake but i called to given number , he said u diposit 5000 but they mentioned 1000 only i think why he is asking 5000 that time i get all information from him it is a fake letter please avoid this type of letters it will spoil company reputation. Why we must pay again to TATA company as Timesjob said theres only one time payment and after that no -one would ask to pay...???.. who lost money please send slip for this mail id srijith.mandya@gmail.com. Those are criminals dont believe court should be giving hang those frauds. The email is not from tata owned domain. Did you know that you can shorten your links with AdFly and make cash from every visitor to your short links. Guyz I too just received that scam message wherein I actually thought TaTa Motors India had sent that message to my rmno. But checking out in the Internet sorted out that it's a fraud message and just saved Rs 4500/- from being lost. Thanks for sharing the blog and information. Your blog is very attractive.